Monthly Reports of 7 – 11 pages on how to Master the Art of Surfing the prevailing energies. Plus: Weekly Updates with the latest information of what we are currently experiencing. SURF SUBSCRIPTIONS ARE AVAILABLE IN ENGLISH, GERMAN, RUSSIAN AND SPANISH. When you subscribe to the Surf Reports, you help support Solara’s work on behalf of the 11:11 and our One Being. Read more about Solara’s Surf Reports! 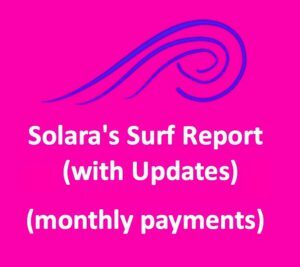 The “Buy now” link below brings you to the PayPal Website where you can arrange for a monthly subscription for the Solara’s Surf Reports and Updates. At the beginning of each month you will receive a password for accessing the Surf Report. During the month you will get Updates by email. You can cancel this subscription any time through the PayPal website.